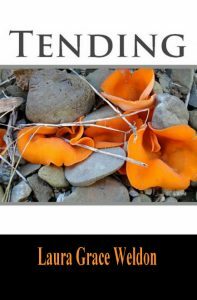 Laura Grace Weldon’s poetry collection, Tending, tells the story of a life deeply felt. Read from beginning to end, the poems collectively form a larger poem detailing images of farm life, domesticity, family life, and beyond. Setting the tone for the collection, her opening poem, “Out of Body,” articulates a child’s sense of empathy, using carefully composed images of bodies, weight, and movement. She writes, “I worked to stay in the small body/my being was given,” then slips out of that embodiment, working her way through a series of expanding scenes. She sees “people hauling heavy lives” and searches for the boundaries between herself and the world she experiences. Blow your nose like a lady. that her face would not sag beyond recognition. That she would never die. The final section of the collection, “Putting By,” offers a sense of legacy. In “Aluminum Epiphany,” she imagines the “archeologists of the future” and the remnants of “indifferent opulence” that they find. Following on a more personal note, she lists wedding gifts: well-used, loved objects symbolizing the same longevity and care that she and her husband have put into their marriage and family. She concludes with “Overhead Calls,” where she gracefully pulls together the by-now familiar contrasts between the general and the specific, the abstract and the concrete, and the old and the new. With the detailed world she’s described, Laura Grace Weldon leads her reader to find a loving, empathic connection to humanity, warts and all. Originally from Rhode Island, Ivy Rutledge lives and writes in the Piedmont of North Carolina, where she shares her life with her husband and two children. Her work has appeared in The Sun, Home Education, Ruminate, The Copperfield Review, and Tilt-a-Whirl, and she recently had a short story included in the Main Street Rag anthology, Altered States. She is currently pursuing an MA in English at the University of North Carolina at Greensboro. You can follow her on Twitter at @IvyRutledge.